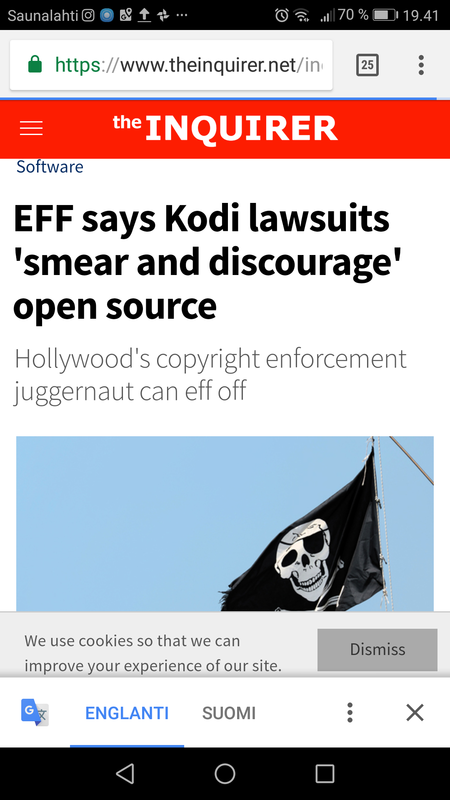 THE ELECTRONIC FRONTIER FOUNDATION(EFF) is concerned about legal activity around piracy-enabled Kodi boxes and wants to know where the line is being drawn between companies that sell innocent platforms, the vagabonds that install add-ons onto them and the people who share pirated material. https://www. “The War on General-Purpose Computing Turns on the Streaming Media Box Community“. It describes how Hollywood muscle is looking to crush open source software developers and development. How streaming boxes running open source Kodi media player software have made video piracy easy with third-party add-ons — THE KODI BOX pitch is hard to resist. A little black plastic square, in look not much different from a Roku or Apple TV, and similar in function as well. For years, piracy persisted mainly in the realm of torrents, with sites like The Pirate Bay and Demonoid connecting internet denizens to premium content gratis. But a confluence of factors have sent torrent usage plummeting from 23 percent of all North American daily internet traffic in 2011 to under 5 percent last year. Legal crackdowns shuttered prominent torrent sites. Paid alternatives like Netflix and Hulu made it easier just to pay up. And then there were the “fully loaded” Kodi boxes—otherwise vanilla streaming devices that come with, or make easily accessible, so-called addons that seek out unlicensed content—that deliver pirated movies and TV shows with push-button ease.